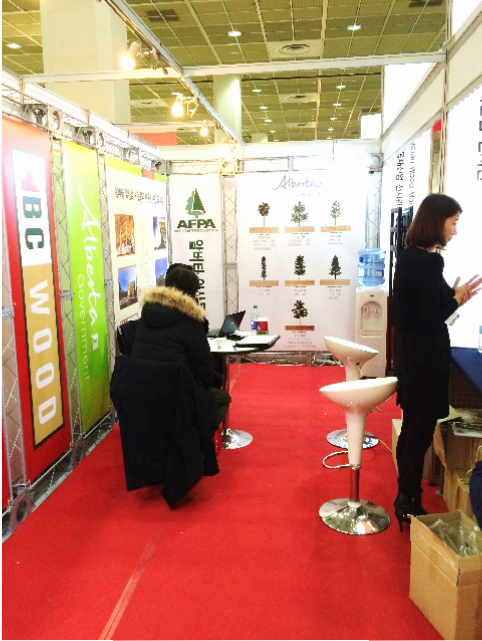 1) Work with BCWood at the Housing Brand 2015 Fair-deploy market materials in Korea Completed Show. Rolled out new Korean AFPA card company profiles, and grading supplement to Alberta Buyers Guide. There were 180 visitors to the booth over the 4 days. 2) Continue market investigations in Seoul and Busan. Seven site visits carried out in the Seoul and Busan area. See Mission Notes below. 3) Meet with Canada Wood and discuss program for next year. 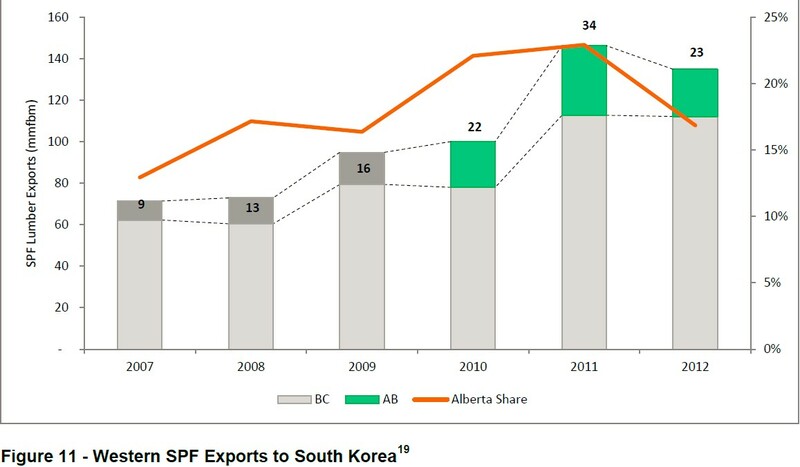 Potential grant funding losses from Alberta severely impact future planning for Korea Wood. 4) Meet with Alberta Trade Office and Embassy Trade Office staff in Seoul. Completed. 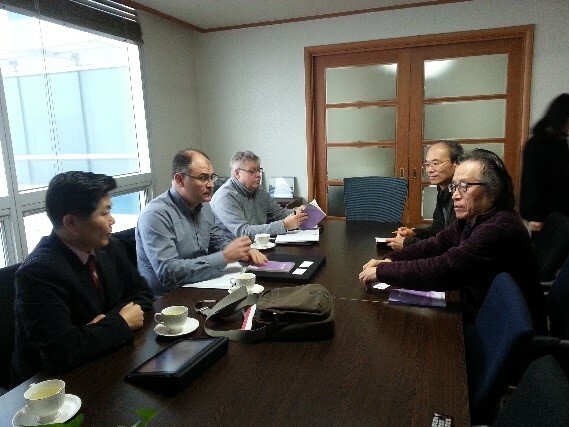 Discussions on possible event to open the Gapyeong Daljeon Demonstration project. Canada Trade office working with European Union and the United States in response to new wood product regarding requirements in Korea. 1) Subject to funding, plan to attend Housing Brand show next September and the Architecture Fair in the fall if it can be tied into Japan activities. 2) Continue developing wood buyer contacts in key ports in Korea. 3) Assist ESRD with Gapyeong Daljeon Demonstration if required. 4) Work with FPInnovations on an industry mission to Korea and Japan subject to funding availability and interest. 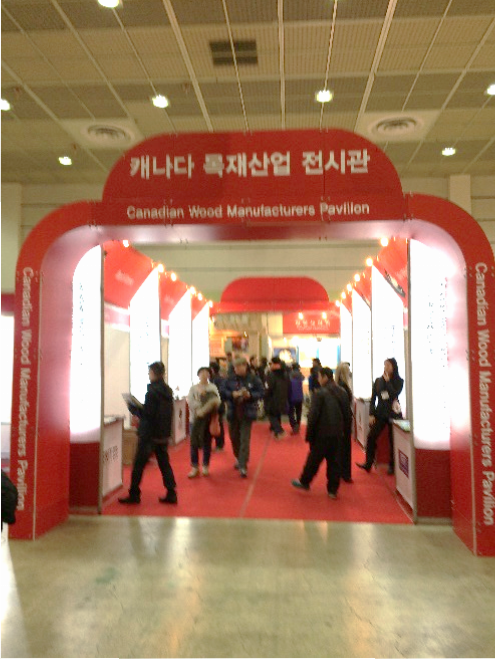 The BCWood Canada Wood pavilion consisted of 7 exhibitors including BCWood and AFPA. There were several hundred visitors to the Pavilion of which about 180 left their cards at the BCWood /AFPA portion of the pavilion. Other business line is a joint venture partnership with large European Company Megawood which produces outdoor building materials, outdoor furniture and decking. Honorary Chair Prof. Kim, Jin Hee KWBA and Kim, Sang Byung CEO Landlovers The KWBA is the major prof essional and industrial society of wood design and architecture in the KOREA. This is the third time we have meet with KWBA. • Training for those seeking to apply for site supervisor and inspector qualifications. • Sitting for examinations are only available KWBA members who have been trained and educated at the KIAD and WBDC. • In future, the KWBA will develop a training program with MLTM for local regional officers who would become accountable and responsible for on-site inspections. • In order to get National Qualification Testing from KHRD (Korea Human Resources Development), which is the government agent for national technical qualification, testing and registration. KWBA started a Wood Design Technical Qualification Examination in 2004. That includes Carpenter and Home Inspector certification levels. See 2012 Korea mission report for further background on the association. Last year 13000 wood frame houses built in South Korea. The goal is to double this level in ten years. Developers now have developments with at least 150 units. There are 7 major housing developments currently underway. As Korea’s prosperity improves, there will demand for country houses. Most Koreans can still not afford to buy a single family dwelling as land prices are very expensive and mortgage rules still require 70-80% down payment with mortgage rates being quite high. In previous visits multiple housing development had been proposed using a peanut house concept. This concept did not get traction with banks who refused to approve mortgages where multiple land owners involved. Some investors building peanut houses and live in one and rent the rest. The market for this type of house is small, currently 500 units per year. Multiple storey, multiple family wooden structures may be difficult to promote in Korea because of concerns with fire safety and the difficulty of finding qualified contractors to build them. The ultimate solution for Korea may be hybrid designs with concrete and wood. Landlovers Korea Co., Ltd www.landlovers.co.kr Landlovers Korea has its main business in development and development consultancy. Its strength in project management has seen the company taking the lead in major and high profile projects in Korea, Singapore and Malaysia. Headquartered in Seoul, Korea, the list of major and high profile projects include facility usage consulting for Seoul World Cup Stadium in Mapo-Gu, Seoul and the development project of the General Hospital located in Gangseo-Gu, Seoul. Its dynamism stems from its key focus of always listening and delivering to the expectations of the customers. Property Development remains the main area of business for Landlovers Group. With its experiences in Korea, Singapore, Malaysia and the Asia Pacific rim in both commercial and residential, as well as customers and land owners. As a natural progression from its business services, Landlovers are able to advise customers on the feasibility aspect of any property development. This initial engagement model is offered to customers who wish to ascertain the project development costs as well as the development value. From such feasibility studies, customers are able to set their desired level of investment returns for any project. As part of the Feasibility Studies services, property development consultancy encompasses the drawing up of the project blue prints. Landlovers with its ability to cover all aspect of property development and project management has its main strength here. From the assembly of a team of experts and consultants to execution and management of the project itself, customers are able to draw up the project blueprints which ultimately ensure the success of the project from the timeline and financial returns aspect. 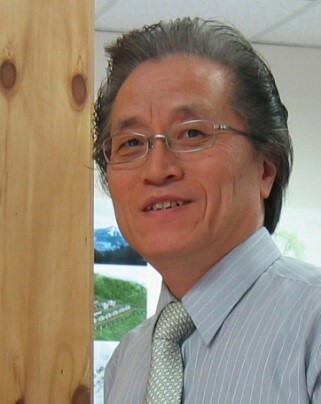 Kim Sang Byung is an Architectural Engineer by profession and has extensive experience in project management. His involvement in some of the region’s high profile projects include the restoration of the Raffles Hotel in Singapore, the Parc Oasis Condominium project in Singapore and the US Embassy project in Saudi Arabia. His expertise in the construction and project management industry has also been recognized by his peers in Korea and he currently sits on various high profile industry associations including the Advisory Committee for Korea Rural Community & Agriculture Corporation. Kim in addition is also the Managing Director of Landlovers Korea Co., Ltd. Multiple stage affordable housing development with schools, recreation, commercial district and health facilities. Entice businesses and workers to develop in areas adjacent to project. Healthy living and low environmental footprint design. There will be 8 phases with project completed in 2019. Houses 900-1200 sg. ft. with passive energy and heating. Parts of complex available to other developers who can introduce their own home design and features. Developer invited us to come down and visit the project when we are next in Korea. 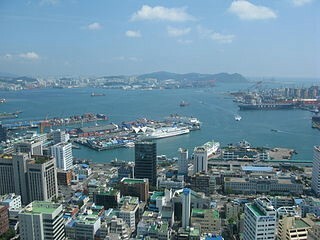 Busan is the fifth busiest seaport in the world, with transportation and shipping among the most high profile aspects of the local economy. Since 1978, Busan has opened three container ports including Jaseungdae, Shinsundae, and Gamman. Busan has one of the world’s largest ports and can handle up to 13.2 million TEU shipping containers per year. The Busan-Jinhae Free Economic Zone Authority, one of two such administrations in Korea, was created to reassert Busan’s status as a traditional international trading centre. The port attracts ships from all over the globe and the surrounding area aspires to become a regional financial centre. Within the Port of Busan, the BPA manages the quay wall where commercial vessels berth, the fishing boat quay, piers, dolphins, anchoring facilities, storage yards and facilities, loading/unloading facilities, cargo distribution and sales facilities, and passenger conveniences. The BPA is committed to providing outstanding services that support national economic growth and make the Port of Busan a central harbor for Northeast Asia. The single most dominant containerized cargo handled by the Port of Busan in 2007 was textiles (82 million tons). Other major cargoes passing through the Port of Busan included electronics (19.2 million tons), plastics and rubber (17.5 million tons), steel and steel products (10.7 million tons), chemical products (10.5 million tons), prepared foodstuffs (9.4 million tons), petroleum products (7.9 million tons), non-metal products (6.2 million tons), automobiles and auto parts (5.6 million tons), animal and vegetable products (4.6 million tons), wood and wood goods (3 million tons), fish and shellfish (2.5 million tons), cereals (1.5 million tons), cement (1.3 million tons), and other ores (1.3 million tons). In addition to 38 million tons of “miscellaneous” goods, the Port of Busan handled other containerized cargoes in 2007 that included fertilizers, meat, scrap metal, leather, fats and oils, iron ore, rough wood, natural sand, milling industry products, sugars, petroleum and other gases, crude petroleum, and coal. South Port in the Port of Busan is the largest fishing base in South Korea. South Port is home to the Busan Cooperative Fish Market which accounts for 30% of the nation’s total marine products sales volume. The Port of Busan’s Jagalchi Market is the wholesale market for refrigerated fishery products, and several processing plants are located within the Port of Busan’s South Port area. South Port covers a total of 90 thousand square meters. It includes over 4.1 kilometers of quays and a 400-meter breakwater. The waterfront area covers 23.9 thousand square meters. Gamcheon Port was created to handle increasing cargo volumes entering and leaving the Port of Busan and to supplement the North Port. Gamcheon Port boasts piers for deep-sea fishing vessels and costal general cargo vessels. It also includes a ship repair yard. The Port of Busan’s Gamcheon Port handles some 12 million tons of cargo per year. Gamcheon Port covers a total area of more than 153 hectares. It contains over 6.6 kilometers of quays and a 1150 meter breakwater. The quays can berth 34 vessels in sizes varying from 50 thousand tons to two thousand tons. The Port of Busan continues to grow as its volume of container traffic increases. The Port of Busan has been forced to use general quays for containers, making cargo-handling complicated and inefficient. Further, container vessels continue to grow: they become bigger and faster every day. The Port of Busan’s aging facilities preclude the docking of larger container ships. 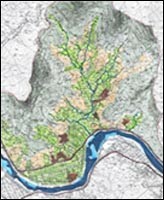 The Port of Busan is also located adjacent to an urban area, and there are limits on port expansion. The Port of Busan decided to built a modern large-scale container terminal on Gaduk Island in 1995. Construction of the new terminal began in the fall of 1997 with the goal of completing the project in 2011. Busan New Port contains the north, south, and west container quays on Gudak Island. The quay wall of Busan New Port has berthing space of 9.95 kilometers (6.1 miles) with 30 ship berths and the capacity to handle over eight million TEUs per year. The Port of Busan’s Gamman Container Terminal opened in April 1998. Four companies operate at the terminal: Korea Express Company Limited, Hanjin Shipping Company Limited, Global Enterprise Company Limited, and Hutchison Korea Company Limited. The facilities include 1.4 kilometers of quays and berthing capacity for four 50 thousand ton vessels. The Gamman Container Terminal in the Port of Busan covers 731 thousand square meters and has capacity to handle 1.2 million TEUs each year. The terminal is equipped with state-of-the-art container-handling equipment. Most of lumber from western Canada is offloaded here. The Shinsundae Container Terminal in the Port of Busan opened in 1991. Operated by Pusan East Container Terminal Company Limited, the facilities include 1.2 kilometers of quays and capacity to berth four 50 thousand TON vessels. Covering a total of over one million square meters, the Shinsundae terminal can handle 1.2 million TEUs per year. The Singamman Container Terminal opened in the Port of Busan in 2002, and it is operated by Dongbu Pusan Container Terminal Company Limited. The facilities include 826 meters of quays that can berth two 50 thousand ton and one five thousand ton vessels. The terminal covers 308 thousand square meters and can handle 650 thousand TEUs of cargo per year. Operated by Hanjin Shipping Company Limited, the Port of Busan’s Gamcheon Container Terminal opened in 1997. It contains 600 meters of quays with capacity to berth two 50 thousand ton vessels. This Port of Busan terminal covers 148 thousand square meters, and it can handle 340 thousand TEUs of cargo per year. In the Port of Busan’s North Port are other cargo- and passenger-handling facilities. The International Passenger Terminal opened in 1978 under joint public operation. The terminal handles both passengers and cargo in the Port of Busan. The quay is 460 meters long with alongside depths from one to 8.6 meters. The quay can berth one 10 thousand ton, one three thousand ton, and two 200 ton vessels at one time, and the quay has capacity to handle 318 thousand tons of cargo. The Port of Busan Coastal Ferry Terminal, opened in 1978, is also under joint public operation. The quay is 480.4 meters long with alongside depths from 6 to 8 meters. The quay can berth seven 500 ton vessels and one vessel of six thousand tons, one of four thousand tons, and one of two thousand tons. The Central Port in the Port of Busan has been operating since 1944. It is operated by Dongbu Corporation Global Enterprise Limited. The quay is 646 meters long with alongside depths from 8.5 to 9 meters. This Port of Busan facility has capacity to berth four 10 thousand ton vessels, and it can handle 180 thousand TEUs and 756 thousand tons of general cargo. The Central Port at the Port of Busan has a 28.9 thousand square meter storage yard. Also in business since 1944, the Port of Busan’s Pier 1 is under joint public operation and handles containers and general cargo. The quay is over one thousand meters long with alongside depths from 6 to 9 meters, and it can accommodate three 10 thousand ton vessels. With a 28.9 thousand square meter storage yard, Pier 1 can handle 381 tons of general cargo and 120 thousand TEUs of containerized cargo. Pier 2 in the Port of Busan has operated since 1944 under joint public management. The quay is 924 meters long with alongside depths from six to 10 meters. The quay can berth one 20 thousand ton, three ten thousand ton, and one four thousand ton vessels. With a 14.5 thousand square meter storage yard, the Port of Busan’s Pier 2 can handle 2.3 million tons of general cargo and 80 thousand TEUs of containerized cargo. Opening in 1944, the Port of Busan’s Pier 3 is operated by five companies. Pier 3 has a 1.3 kilometer long quay with alongside depths from 6.2 to 9 meters and capacity to berth one 20 thousand ton, three 10 thousand ton, two five thousand ton, and one 500 ton vessels. With a 61.7 thousand square meter storage yard, Pier 3 has capacity to handle 693 thousand tons of general cargo and 260 thousand TEUs of containerized cargo per year. Pier 4 in the Port of Busan has also operated since 1944, and it is operated by Kukje Transportation Company Limited and Dong Bang Company Limited. With a 1.3 kilometer quay with alongside depth of 5.5 to 8.4 meters, the Port of Busan’s Pier 4 can accommodate one 20 thousand ton, four ten thousand ton, two five thousand ton, and one three thousand ton vessels. It has capacity to handle more than 2.3 million tons of cargo. Operated by Wooseong Company Limited, the Port of Busan’s Grainary Pier opened in 1978. With alongside depth of 12 meters, the 371 meter long quay specializes in handling grains and can accommodate one 50 thousand tons vessel. It has capacity to handle over 1.2 million tons of cargo. Opening in 1978, the Port of Busan’s Pier 7 was constructed to handle scrap metal and iron ore, and coal; however, decreasing volumes of cargo in those areas has led to the Pier being converted for handling of general cargo. Pier 7 can handle a total of over 3.7 million tons of cargo for the Port of Busan. Operated by Dongkuk Transportation Company Limited, the Port of Busan’s Pier 7-1 has a 539 meter long quay with alongside depths from 3 to 10.7 meters. It can accommodate vessels of 15 thousand (one vessel) and five thousand (two vessels) tons. Pier 7-1 has more than 20.4 thousand square meters of storage yard. Pier 7-2 is operated by Samju Shipping. Its 135-meter long quay has alongside depths from 10 to 11 meters, and it can accommodate one six thousand tons vessel. It has a 32.5 thousand square meter storage yard. Pier 8 in the Port of Busan is used for military supplies and miscellaneous goods. Its 1 kilometer quay has alongside depths from 4.3 to 10 meters, and it can berth vessels of 15 thousand tons (3 vessels), 10 thousand tons (one vessel), five thousand tons (one vessel), and one thousand tons (one vessel). Pier 8 has capacity to handle 693 thousand tons of general cargo and 260 thousand TEUs of containerized cargo. The Port of Busan’s Yongho Pier opened in 1990 to handle general cargoes including hazardous and refrigerated goods and fishery landings. Its quay is 210 meters long alongside depth of 11 meters that can accommodate one 20 thousand ton vessel. The Yongho Pier in the Port of Busan has an almost seven thousand square meter storage yard and has capacity to handle 456 thousand tons of cargo. 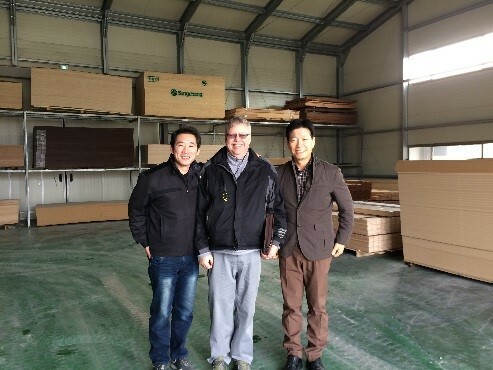 Gungwoo is the main supplier pro-store for builders in the Busan area and Jeju Island. They will be introduced to merit Kitchens as a follow-up. Looking for appearance grade lumber as well as 1 inch stock. Referred them to several companies. 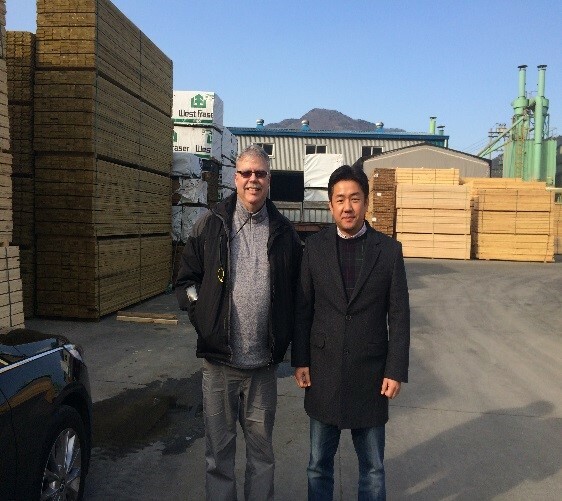 Alas Korea Co Kyung Sung Timber Co. Looking for 1 inch lumber, plywood OSB and particle board. Passed on interests to appropriate companies. Looking for 2 and better SPF as well as appearance grade 4 square pine for pressure treating. Using hemlock for pressure treatment as well. Wants wider SPF boards 2X10 and 12s. Would like to find a replacement for Gorman Brothers wood that had in past. Quality and amount has declined. Referred request to several mills. Completed a review of the past year’s program and discussed tentative plans for next year. The Korea office and program experienced cutbacks last year due to tightening of funding. Proposed further cuts to grants next year will severely impact the Korean office to remain viable. Discussed the market situation which is detailed below. Discussion on proposed regarding system proposed by the Korean Forestry Service. See Appendix E. This policy shift will impact Canada’s ability to continue selling products into this market. As other countries are impacted as well, diplomatic and trade representative discussions are underway. Canada Wood and American Panelwood Association will collaborate on further actions. FPInnovations are 5 years into a 20 year field test on pressure treated Hemlock and SPF durability. FPInnovations is asking for Canada Wood and Alberta help to pay travel costs for FPInnovates staff to continue field trials. Canada Wood and Alberta Trade office have formed a close working relationship and continue to look for opportunities to work together in the future. Most recent collaboration has been the Gapyeong Daljeon Demonstration project. AFPA may attend the Architecture Fair with Canada wood in late September if there is sufficient travel budget to allow attendance. The South Korean economy expanded 3.3% in 2014 as increased facility investments offset slowing growth in construction investment and exports. Facility investment increased 5.8% in 2014, turning around from a 0.8% on-year contraction in 2013. Construction investment growth, however, sharply slowed to 1% from a 5.5% growth in the previous year. Private spending came in at 1.8%, remaining mostly unchanged from a 1.9% on-year gain in the previous year. Their per capita gross national income, a gauge of the population’s purchasing power, reached US$28,180, up $2,001 from 2013.Exports rose 2.8%, slowing from a 4.3% increase in 2013, while growth in imports quickened to 2.1% from 1.7%. South Korea’s gross domestic product grew 0.8% in the 1st quarter of 2015 from three months earlier on increased construction investment and improved spending. From a year earlier, the economy expanded 2.4% in the first quarter. Consumer spending increased 0.6% from three months earlier, slightly quickening from a 0.5% rise in the fourth quarter. Government spending growth stayed on par at 0.2%. Growth in construction investment sharply gained 7.5% on an increase in residential building projects. South Korea posted a trade surplus for the 38th month in a row in March of 2015 by reaching US$8.4 billion, up from $7.8 billion in February and $3.5 billion a year earlier as imports dropped at a faster click than exports. Consumer price index inched up 0.4% in March from a year earlier, the slowest pace in nearly 16 years signaling that the economy remains gripped by flaccid private consumption. Jobless rate dropped to 4% in March from a month earlier due to seasonal factors and more hiring by the manufacturing and service sectors. Volatility in the won-dollar exchange rate hit a three-year high in the first quarter of 2015 as the foreign exchange market seesawed due to speculation over a possible U.S. interest rate hike. The exchange rate for Canadian Dollar averaged at 882.70 won in March, 2015, dropped 8.42 % from 963.86 in March, 2014 and slightly up by 0.61% from 877.36 in one month earlier. Mounting household debt after three rounds of rate cuts in less than a year keeps policymakers wary while the recovering local housing market means borrowings could rise above the current level, putting South Korea’s household debt-to-income ratio near the top among major economies. South Korea’s housing starts in year-to-date February of 2015 increased 6.5% to 10,389 buildings from a year earlier 9,759 buildings owing to the continuous government measures to revamp the country’s property market. Housing permits in the same period inched up 1.1% to 11,575 buildings from a year earlier 11,453 buildings. The number of wood building permits and wood building starts in year-to-date February of 2015 remarkably increased 24.4% to 1,896 buildings and 13.2% to 1,345 buildings respectively compared with those in 2014. Overall, the South Korean real estate market conditions are continuing to show signs of improvement. Apartment prices in South Korea increased at a faster rate in the first quarter of 2015 compared with a year earlier reflecting growing demand for property purchase amid low interest rates. Prices of apartments in the Seoul area shot up 0.75%, with its pace nearly doubling from 0.39% a year ago. Overall, apartment prices in the metropolitan area jumped 0.95%, compared with 0.54%. South Korea’s overall home transactions shrank slightly from a year earlier in February, 2015 while the number of home transactions in the capital region surged to a nine-year high. The number of home transactions came to 78,864, down 0.4% in February from the same month last year. However, home transactions in capital Seoul jumped 10.4% on-year to 12,990 in February last month with the number for the entire capital region, including Gyeonggi Province and the western port city of Incheon, growing 4.2% to 37,502. By type, transactions of apartment units, the most common form of housing in South Korea, slipped 1.6% on-year to 57,885 in February, while transactions of row and detached houses gained 4.6% and 0.7%, respectively, to 11,999 and 8,980. In 2014, Canada concluded an agreement with the EU and implemented its FTA with South Korea, Canada’s first agreement with an Asian country, as well as putting into effect an investment protection agreement with China. BC softwood lumber export volume to South Korea for the first two months in 2015 dropped 15.5% to 31,610 cubic meters as compared to 37,418 cubic meters for the same period in 2014. The drop was largely attributed to the three-day traditional Lunar New Year’s Day break that fell in February this year, instead of January in 2014. However, export value in year-to-date February continued to increase 2.6% to CAD$10.309 million as compared to CAD$10.047 million in the same period in 2014, owing to the strengthened Korean won against Canadian dollar. Alberta 2014 share SPF estimate to be 12% of BC numbers and is worth about 100 Million CAN$. Market loss due to high percentage of spruce in SPF. Koreans cannot use spruce for their pressure treated products. Koreans also are looking for 4 square materials and appearance grade lumber versus normal 2 and better SPF that has wane. Alberta mills have a cost disadvantage at present due to currency fluctuations and extra transportation costs. New First Secretary is Leslie-Ann Reed who is replacing Andrea Moen recently reassigned to Tokyo. They are working closely with their counterparts in the American Embassy on the regarding issue. Alberta Trade office is looking for participation at upcoming lifestyle fairs. These fairs give Alberta to highlight our lifestyle and of course exports such as wood products and beef. Will be working actively to get Alberta elected officials over for ribbon cutting of Gapyeong Daljeon Demonstration project when landscaping completed this summer. Fall 2015 may be first opportunity. Minister Thomson from BC may want to do ribbon cutting with his fall mission. An important producer of cement and other construction products, South Korea imports 90% of wood products used in the market. This trend is expected to continue. In 2013, South Korea imported over $570 million in forest products from Canada, including wood, pulp and paper and other forest products. Major competitors are China, the US, Indonesia, New Zealand, and Malaysia. 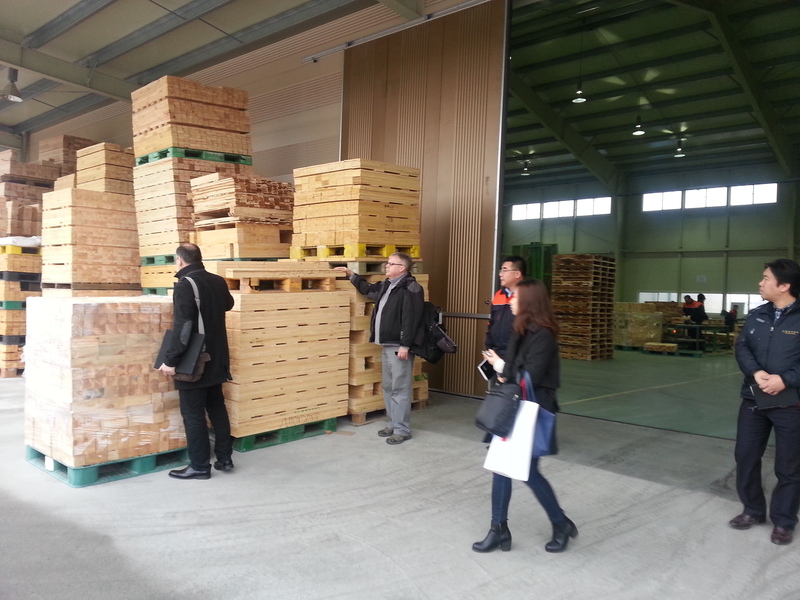 The South Korean market receives wood products from 100 different countries and, as a result, it is implementing new regulations in order to address differences in quality. South Korea is working to address the carbon footprint and “sick house syndrome” from non-wood construction methods. South Korean consumers view wood as a natural, healthy product which promotes wellness which could lead to increased demand for wood-frame housing. The South Korean government is focusing on green policies, including ‘sustainable housing’, which present an opportunity to showcase Canada’s sustainable forests. South Korea is generally a price-sensitive market. The sector is focused primarily on consumers who are looking at rural or leisure housing with unique wood design features. Although the overall South Korean construction market is sluggish due to over-building, there are still opportunities in these segments, as the population ages and shifts to a retirement lifestyle. Recently, Canada and South Korea signed a Memorandum of Understanding (MOU) on cooperation in the field of forestry. With this MOU, it is expected that the two countries will strengthen and expand the bilateral relationship in both commercial and non-commercial areas. Current Issues : Korea imposing a new grading system on Canadian wood products that are already graded in North America. (See Appendix C) Re-grading will result in Canadian lumber being graded down and will fetch a lower market price in comparison with North America. Many producers are backing off this market for now. This grading system will also impact American wood producers. Both countries are making representation to the Korean government and Korean Forest Service on this issue. The Europeans are in a position to capture more market with the quality of products that fit the Korean Grading system combined with competitive prices due to a weaker Euro. Key South Korean companies include: Samik, Dewha, NS home, Hanyang Trading, Hanglass, KCC, LG Hausys, and Eagon Windows & Doors Co. Ltd.
Canadian companies in market include: Canfor, Interfor, Tolko, Weyerhaeuser. South Korean consumers want good quality at a competitive price. Interest in environmentally-friendly building materials and energy-efficient housing.